Examples of thrift appear in numerous classic offerings from Louisiana’s bakeries. Unused puff pastry is recycled as “shoe soles.” Some bakers bind leftover doughnuts together with syrup and spices, bake them, and offer the result as “sinkers.” A similarly frugal practice utilizing cake scraps moistened with rum is known by New Orleanians as “Russian cake.” Baton Rouge and Lafayette residents generally know it as “Russian rum cake.” While it does not enjoy international fame, New Orleans, much of South Louisiana and at least one other part of the world (no, not Russia) treasure this treat. One often has to explain Russian cake these days, so I generally term it “the bread pudding of cakes” as a shorthand definition. David Haydel of the New Orleans area Haydel’s Bakery once referred to it as “the jambalaya of all cakes.” Neither term is precise because bakeries still making the delicacy stress that they no longer use stale ingredients; instead, trimmings from freshly baked sheet cakes are combined with refrigerated or frozen bits to create the Russian cake. When private cooks in elite New Orleans homes prepared the cake, they usually called it Creole trifle. As with many cherished, traditional delicacies, the origins of Russian cake are murky. The Charlotte Russe dishes described in Lafcadio Hearn’s 1885 La Cuisine Creole bear little resemblance to Russian cake, but one of the trifles included in his book calls for broken-up ladyfingers mixed with macaroons and a cup of wine. Several home recipes for Russian cake include ladyfingers and red wine in their lists of ingredients. A recipe for Parisian Charlotte Russe in the 1922 Picayune Creole Cookbook makes use of stale ladyfingers and macaroons. What made the dessert “Russian”? Quite likely the name transferred from “Russian tea,” which in the late 1800s meant any drink containing rum (not vodka, surprisingly). Red wine and sherry are found in some of the tea and Russian cake recipes. Newspaper mentions of Russian cake in the United States first appear not in Louisiana but in an 1898 Kansas newspaper as a recipe for home bakers who may be seeking desserts pleasing for kids. Russian cake first shows up in a New Orleans paper as a prize awarded at a fraternal organization’s meeting in 1913. The Charles A. Kaufman Co. department store on Dryades Street placed one of the first newspaper bakery ads in 1923. They featured several options for Thanksgiving Day dinner desserts, ranging in price from 30 to 90 cents; Russian cake sold for 30 cents, while mincemeat cost 40 cents. D.H. Holmes Restaurant and Bakery offered either iced vanilla, strawberry or almond versions of Russian cake in the mid-1920s. My parents traditionally purchased the cake at Solari’s Market in the French Quarter until it closed in 1965. By the time I was born, the bakery at the Maison Blanche department store most often supplied our Russian cake, always a special treat. My first exposure remains a standout experience: while I eyed its mélange of colors, my parents warned me not to eat too much because it was very rich and contained rum. The technicolor combination of cakes held together with chunks of jelly and drenched in alcohol produced a vaguely bubblegum-like flavor. These days, Russian cake devotees find it harder to track down their beloved dessert. Located in the Marigny neighborhood of New Orleans, Alois J. Binder Bakery sends french bread and sandwich loaves throughout town via their “Poor Boy Express” delivery trucks, but they also produce an excellent, traditional Russian cake. Mary Binder Walters continues to use homemade raspberry jam and real rum to yield a moist cake that can reconnect New Orleanians to their childhood memories. Haydel’s also makes a good version that anyone in the world can sample, thanks to their popular shipping business. Dottie Haydel mentions that one of their regular customers has Russian cake airlifted to France for his annual Bastille Day celebration. Binder and Haydel’s emphasize that unlike the “lost bread” one transforms into bread pudding, the scraps they press into Russian cake are fresh or fresh frozen ones. Cubes of wedding and other dense cakes are combined with yellow and devil’s food cake bits and pressed into specially designed wooden molds. Historically, bakers used a smooth white-pine box with a removable base, most likely lined with parchment paper to prevent the cake from adhering to the wood, according to Walters. Binder’s original box was 17 by 25 inches. Walters begins by baking a thin wedding cake layer for the bottom of her 16-by 12-inch pan. She breaks up sections of cake to form the first layer of filling, douses it in rum and spreads raspberry jelly along the top. She repeats this about 3 or 4 more times before finishing off with another solid wedding cake slab. Large bags of flour or sugar are placed on top to compress the cake overnight or longer in a refrigerator. Most bakeries present the final product topped with frosting and round rainbow-colored sprinkles. Another essential ingredient in the Binders’ product is their grandfather’s recipe for raspberry jelly. Since the Binders’ original bakery opened in the early 1900s, they have been renowned for their raspberry jelly donuts. Coupled with the traditional rum, this family separate Binder’s Russian cake from the rest. By the early 1980s, fewer bakeries were offering the cake. 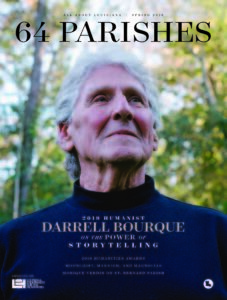 For several weeks, people queried Times-Picayune food columnist Myriam Guidroz for a recipe. Unfamiliar with the term, Guidroz initially asked her readers to explain the cake. The recipe submitted by a woman from Lafayette seemed meant for a commercial bakery as it produced a 21-pound cake. It also demanded a bit of carpentry work before getting started: “I have a box my husband made large enough to hold half of an 18 x 12 inch baking pan. (The measurements of the box are approximately 10 inches wide by 14 inches long by 7 inches high. )” Wing nuts allowed the box to be disassembled when the cake was done. Both U.K. and the U.S. fans associate the cakes with the holiday season. New Orleans bakeries sell many more cakes during the holiday season, and some only produce it during November and December. Dottie Haydel says she must always bring one to a friend’s New Year’s Eve party. 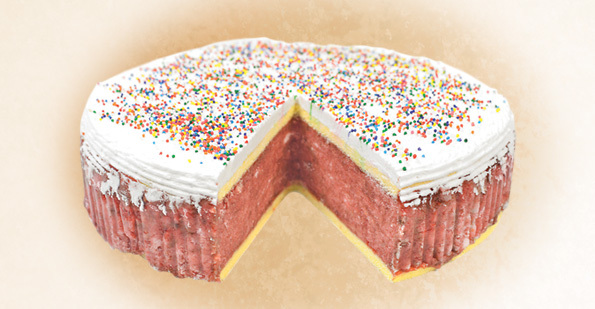 How an English raspberry trifle or an Austrian torte transformed into a Russian cake and ended up on the endangered treats list in at least two parts of the Atlantic world remains an enigma. Those who want to make their own Russian cake may try out their carpentry skills or follow the recipe included in Rema and Richard Collins’ New Orleans Cookbook or the one Marcelle Bienvenu and Judy Walker presented in their post-Katrina Cooking Up a Storm: Recipes Lost and Found from The Times-Picayune of New Orleans. I say bollox to the woodworking and head straight to the closest Louisiana bakery that offers the cake or go online to order Haydel’s. Michael Mizell-Nelson, Ph.D., is an associate professor and public history program coordinator at the University of New Orleans. 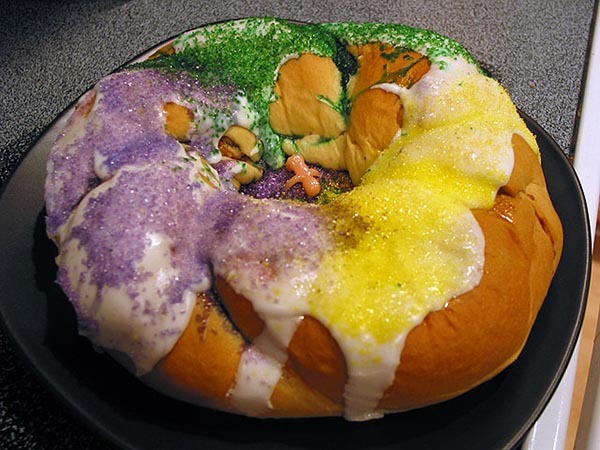 King cakes are traditional in many areas of the world and get their name from the three Biblical kings who journeyed to honor the Christ child with gifts of gold, frankincense, and myrrh on the twelfth day after his birth.